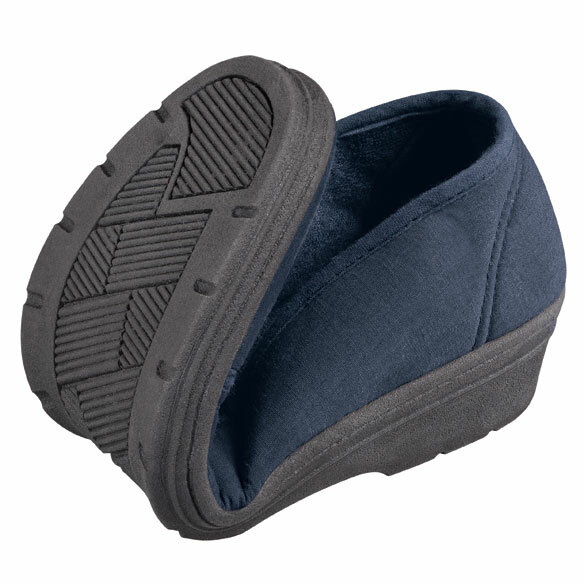 Comfort fit elastic slip ons stretch for a perfect fit and are ideal for any casual occasion. They provide all-day comfort with extra safety and stability. Cotton upper with elastic panel. 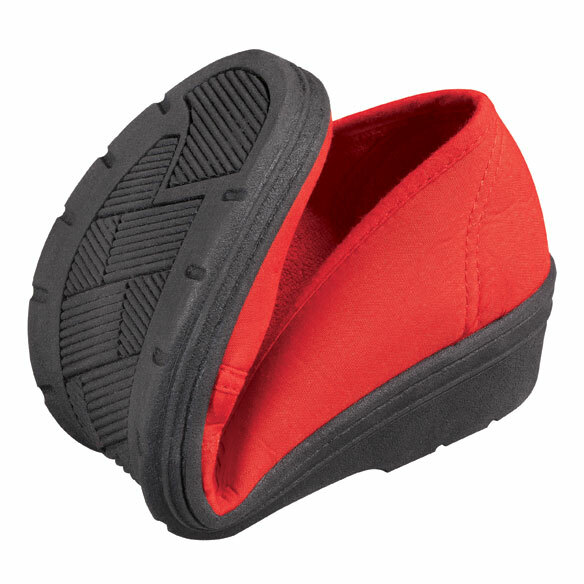 Slip ons have a cushioned, terry-lined insole. Specify color. Specify size: 36, 37, 38, 39, 40 or 41. These fit perfectly and are very comfortable. Cute and comfy - what more is there! These shoes fit my wife's feet exceptionally well. She has difficulties finding shoes that she can wear without some kind of problem. Once she received this pair, it immediately became her favorite one. A ANSWER TO A --------FIT!!!!! As usual i found what i was looking for at Easy Comforts. i broke my leg and needed comfortable house shoes as i recovered my balance and walking. These slip ons "filled the bill" and i am NOW ordering 2 more pairs! The colors are excellent,too EASY COMFORTS really do BRING COMFORT in your time of handicapped NEED. These shoes are more comfortable than I expected. I wear them for errands, appointments, and casual dining. Stretch fabric is lightweight and comfortable. I ordered a pair in red and just ordered another pair in navy. Clean up is easy...got some mud on one and washed right off. Going to order 2nd pair and maybe another so I have 3 pairs going into summer. I would normally not buy this type of shoe for myself but after buying a pair for my Mother, she raved about them so much that I had to try them for myself. I LOVE them!!! So comfortable and the small wedge heel helps with lower back pain. I have mine in navy and absolutely fell in love with them. Going to order red soon and another navy. 11 size and W width fit perfect. I have nerve damage done and these do NOT bother my feet unlike others I have. Sure wish they came in Black. Great for just "knocking around". Looks good with jeans. I wear these with my jeans when I don't want to wear tennis shoes. They look great. I would have to buy a smaller size. They are to big . but they look good and I would buy a smaller size. I would buy these shoes again.Comfortable & easy to put on. Love the shoes very nice. Need comfortable shoes! Hope it will be?? My mom loves red and was looking for a new pair and she thought looked comfortable! I like to have a pair of house shoes is what I call them. 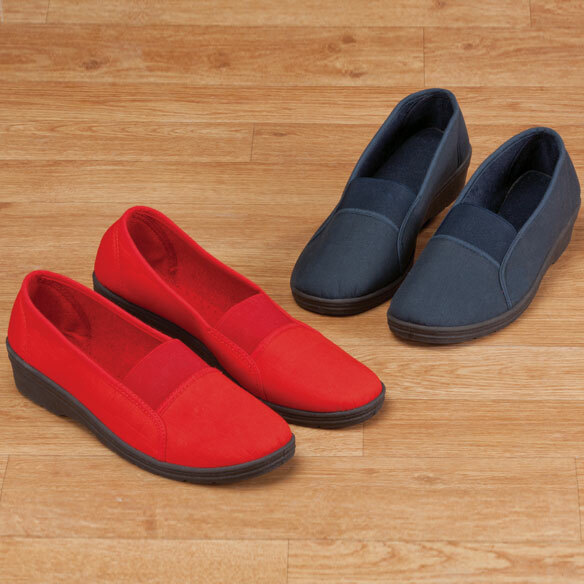 Which to me is just something easy to slip on, comfortable, with hard sole because it reduces the risk of falling, and I can easily go get the mail and such. Just what I was looking for in comfort shoes. anymore. Like the looks as well. I read the reviews and they helped me make my decision. I'm looking for comfort and style for my feet. These shoes looked just right for my foot shape. I'm hoping that they'll be my 'go to' shoe thru the summer months. I had extensive vascular surgery on one leg. I am still experiencing swelling of one leg and have to wear bandages that need extra room or stretch in the shoe. One foot is very tender because of nerve damage (neuropathy). I am hoping that these shoes will be more comfortable than m other ones. I have been wearing slippers mainly for the past 9 months and will appreciate wearing a shoe. Comfort of a stretch upper due to foot problems. because they look comfortable and I like red. Because I need a comfortable pair of slip oms in navy blue. Flexible sole with a little heel. I have another pair of these and they are quite nice for the money. they will be perfectly comfortable on my hammer toe. for a soft daytime shoe. I need a comfortable shoe for swollen feet. I read the reviews, and I am confident these slip ons will serve me well. wanted grey shoes.. They look comfortable. What is a 37 in shoe sizes? BEST ANSWER: Thank you for your question. A European size 37 converts to an American size 6-7. We hope this information will be of help to you. I understand the size conversions, but I cannot find size 34 or size 5. Help. How do I know what size I wear? I wear a size 10 shoe. WHAT SIZE FOR 7 1/2 ? BEST ANSWER: Thank you for your question. We do not consider these as wide.We hope this information will be of help to you. Are they loose fitting shoes for a wide foot? BEST ANSWER: Thank you for your question. These are not designed or considered as wide. We apologize for any inconvenience. I wear a 61/2 shoe but 7 in athletic shoes . I have square toes and find many slippers or shoe items are too short. How do these run? BEST ANSWER: Thank you for your question. We would recommend a size 37 for a shoe size of 6.5 or 7. We hope this information will be of help to you. What is size 8.5 or 9 in European size? BEST ANSWER: Thank you for your question. We would recommend a European size 39 for a shoe size of 8.9 or 9. We hope this information will be of help to you. BEST ANSWER: Thank you for your question. For a shoe size of 11 we would recommend a size 41. You may also consult the size chart located right next to the overview tab above the description of the item to help determine which size would be best for you. We hope this information will be of help to you. what shoe size do you have ? BEST ANSWER: Thank you for your question. You may consult the size chart located right next to the overview tab above the description of the item to help determine which show size would be best for you. We hope this information will be of help to you. I need a size 34 or 41/2 Do you have either of those sizes available? BEST ANSWER: Thank you for your question. Yes, this item is currently offered in a size 41. We hope this information will be of help to you. what size would I order if I wear a size 8? BEST ANSWER: Thank you for your question. You would order size 39. We hope this information will be of help to you. In looking through peoples questions and your answers you keep referring to a size chart. I don't see it, where is it? BEST ANSWER: Thank you for your question. The size chart tab is next to the Overview tab. Located above the description. We hope this information will be of help to you. should half sizes go up or down? BEST ANSWER: Thank you for your question. You will want to go up if you usually wear a half size. For instance if you usually wear a 8.5, you will want to order the 9. We hope this information will be of help to you. what do the size mean i need a 11w? BEST ANSWER: Thank you for your question. The size are European and a size 11 would be size 41-42 in European shoe. We hope this information will be of help to you. BEST ANSWER: Thank you for your question. Yes, you can machine wash them on the gentle cycle and air dry. We hope this information will be of help to you. What size would I order for an ladies 11M? I wear 8 w what size would order? BEST ANSWER: Thank you for your question. These are not made in a wide width. We apologize for any inconvenience. Do you carry any shoe in a wide width ? BEST ANSWER: Thank you for your question. Unfortunately this show does not come in wide.We apologize for any inconvenience. how do i choose size i weare a 8 1/2? BEST ANSWER: Thank you for your question. We suggest going with the 8-9, which is the 39. There is a size chart tab available as well on the advertisement. We hope this information will be of help to you. What size is a size 6? BEST ANSWER: Thank you for your question. Size 36 is a US size 6, a 37 is a US size 6-7. We hope this information will be of help to you. what is 41 in shoes size? BEST ANSWER: Thank you for your question. A 41 is a US size of 10-11. We hope this information will be of help to you.